The revision of PP1361 will update previous information on the three wheat rusts. Growers, consultants and county agents will be able the use this information for disease diagnosis. Three rust fungi have the potential to infect wheat and cause economic damage in North Dakota. 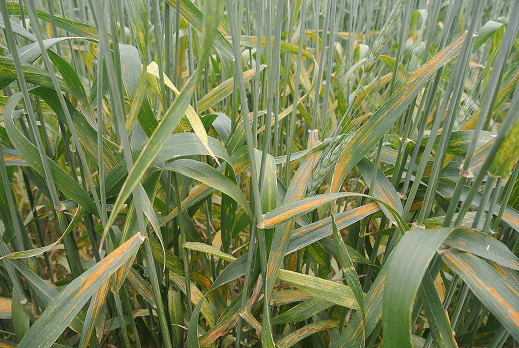 Wheat leaf rust is the most common rust disease observed. Stem rust historically caused severe losses, but resistant varieties have made this disease rare in recent decades. Stripe rust is observed when relatively cool springs and summers occur. Wheat leaf rust, caused by the fungus Puccinia triticina (formerly recondita f. sp. tritici), reduces wheat yields in susceptible varieties when weather conditions favor rust development and spread. The most characteristic signs of the leaf rust pathogen are rusty-red spores found in round to oval pustules breaking through the leaf surface (Figure 1). These spore masses are detected first on wheat in North Dakota in late May or early June, generally in the southern-most counties, and on lower leaves where higher humidity and longer dew periods occur. 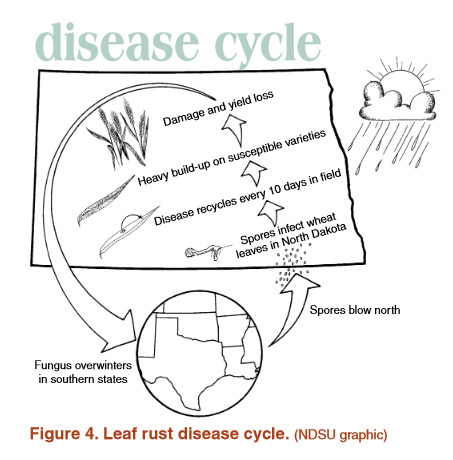 Disease cycle: Leaf rust develops early in the spring on wheat grown in the southern U.S. Spores are carried by wind currents northward across the Great Plains as the wheat crops develop (Figure 4). Leaf rust epidemics occur when the following factors are present: viable spores, susceptible or moderately susceptible varieties are grown, periods of prolonged moisture (dews) and favorable temperatures (60 to 80 degrees Fahrenheit). Relatively cool nights combined with warm days are optimum conditions for leaf rust development. Under favorable environmental conditions, spores will germinate and penetrate into the leaf. Within a week to 10 days, new pustules will erupt through the leaf surface housing more fungal spores. These newly produced spores are wind-blown to other wheat leaves or fields. By the end of the season, severe infection may result in reduced yields and lower test weights. Yield loss and reduction of test weight are related to disease severity and time of infection. 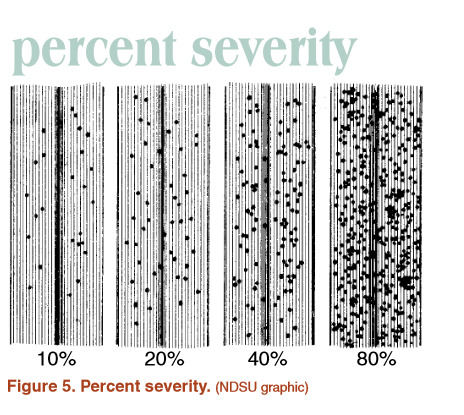 Yield losses of 30 to 40 percent have been recorded when severe infection occurred before flowering and damage on the flag leaf was high (greater than 60 to 100 percent, see Figure 5). However, if severe leaf rust does not occur until the dough stages of kernel development, yield losses will not be as high. Host resistance is an excellent means of controlling leaf rust. Resistance limits infection, fungus growth and spore formation. Resistance levels vary among varieties and are classified accordingly: R = resistant, MR = moderately resistant, MS = moderately susceptible and S = susceptible. Resistant and susceptible wheat cultivars react differently to infection. If a variety is resistant, the infection is slowed or stopped and yellowish-white “flecks” may develop at the site of spore penetration. Moderately resistant varieties develop yellowish-white spots with a small amount of spore production in the center (Figure 6). Moderately susceptible varieties develop small reddish-orange pustules surrounded by a yellow-white halo (Figure 6). Susceptible varieties do not have the ability to retard fungal growth; the fungus grows extensively and produces relatively large pustules that may produce about 1,000 spores daily, each one of which is capable of re-infecting wheat (Figure 6). Therefore, this disease can increase rapidly and epidemics may occur when conditions are favorable for leaf rust development. The population of the leaf rust fungus is genetically diverse and made up of many races. Different races have the ability to cause infection on varieties with different resistance genes. The leaf rust pathogen is dynamic, and races are changing constantly. Varieties formerly considered resistant can become susceptible if new rust races arise. Resistance levels are updated each year for varieties. Consult the NDSU Extension Service publications A574, “North Dakota Hard Red Spring Wheat Variety Trial and Selection Guide,” and A1196, “North Dakota Hard Winter Wheat Variety Trial and Selection Guide,” for current rust resistance ratings of public and private varieties. 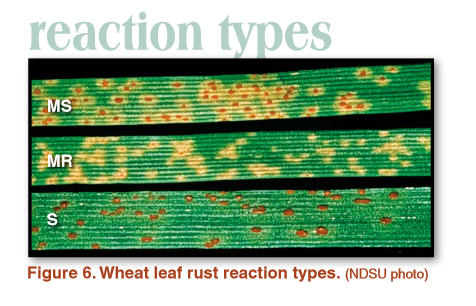 Generally, durum varieties are considered resistant because of their “slow rusting” reaction; consult NDSU Extension publication A1067, “North Dakota Durum Wheat Variety Trial and Selection Guide,” for specific durum variety responses to leaf rust. In North Dakota, the greatest response to leaf rust control in spring wheat generally has been when fungicides are applied at flag leaf or at the flowering (Feekes 10.5-10.51) growth stages when the flag leaf is fully extended. Application at the flag leaf stage generally is recommended in North Dakota only if leaf rust becomes visible on the flag leaf prior to heading. No matter what the growth stage is during application, if more than 5 percent of the flag leaf is covered with leaf rust, you probably are too late to spray because many spores already may have penetrated the leaf, producing infections that will not be visible for seven to 10 days. Good coverage is essential for control; 10 to 15 gallons of water per acre are recommended for ground application, while 5 gallons of water per acre are recommended for aerial application. Individual labels may have slightly different requirements, so consult the label of the individual fungicide product for appropriate application timing, registered rates, preharvest intervals and restrictions against grazing or using straw for bedding. Information on the risk of leaf rust development may be found at the following disease forecasting website. Disease risk information is provided based on weather data from North Dakota Agricultural Weather Network (NDAWN) locations. Cause and signs of disease: Stem rust is caused by the fungus Puccinia graminis f. sp. tritici. 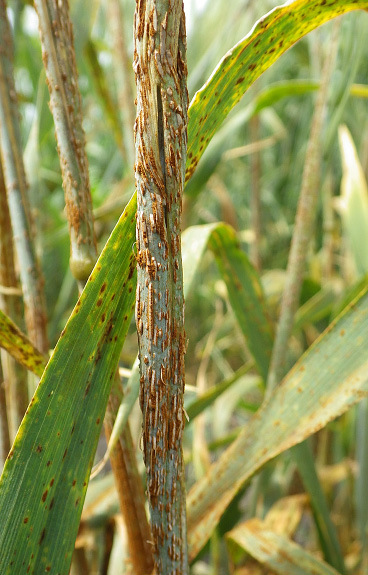 The most characteristic signs of the stem rust pathogen are irregular-shaped pustules filled with dark red-brown spores erupting through the plant tissue. Although pustules are found primarily on stems and leaf sheaths, the leaves, glumes and awns also may be infected. Pustules generally are elongated and have jagged edges on the wheat stem (Figure 2). Stem rust can result in severe lodging and reduced yields and test weights. Disease cycle: The alternate host of stem rust is the common barberry, a plant in which the fungus may overwinter and go through sexual recombination. Common barberry plants were eradicated in the spring wheat region in the 1950s to reduce the chance of this fungus overwintering and undergoing rapid genetic changes. Consequently, infection in North Dakota usually is caused by spores blown into our region from states to our south, similar to leaf rust as seen in Figure 4. The stem rust fungus infects at warmer temperatures than leaf rust, with an optimum temperature for development near 80 F, and development stopping at temperatures above 100 F. These temperatures often coincide with the later stages of maturity of wheat in North Dakota, resulting in a late-season appearance. All spring wheat and durum wheat varieties currently grown in North Dakota are resistant to the races of stem rust prevalent in the U.S. A few winter wheat cultivars are susceptible to prevalent races. A new, highly virulent race group of the stem rust pathogen has been identified in East Africa (originally referred to as race UG99), and most currently available spring wheat varieties are susceptible to this new race, which will pose a threat to our wheat crops if it arrives in the U.S. The U.S. Department of Agriculture’s Cereal Disease Laboratory in St. Paul, Minn., and other agencies are monitoring the movement of this new race and screening wheat varieties and new germplasm for resistance. Resistance is the primary means of control for stem rust. Cause and signs of disease: This disease is caused by the fungus Puccinia striiformis f. sp. tritici. The infection is characterized by a yellow-orange spores that form in parallel lines on the leaf surface (Figures 3 and 7). The oval, darker pustules of leaf rust are distinguished easily from the infections of stripe rust on a single leaf (Figure 3). 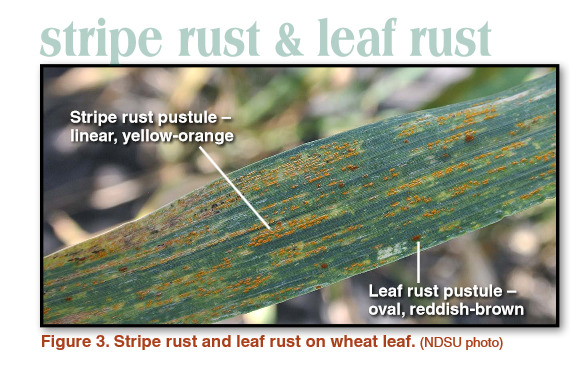 Disease cycle: Historically, stripe rust epidemics have been rare in North Dakota, but incidence of the disease has increased since 2011. Like the previous two wheat rust pathogens, spores are carried into North Dakota on winds from southerly states. The stripe rust fungus has the lowest optimal temperature for growth (50 to 60 F) of the three rust fungi. Cool, wet conditions favor this rust, and temperatures in North Dakota usually become too warm in July for any rapid development of this disease. North Dakota wheat varieties are not screened for resistance to stripe rust because of its rare occurrence. Most of the available hard red spring wheat varieties are moderately susceptible or susceptible to stripe rust, whereas most of the available winter wheat varieties have some level of resistance. The fungicide chemistries that are effective for wheat leaf rust are effective for managing stripe rust. Similar to wheat leaf rust, fungicides should be applied in a manner to protect the flag leaf.